Of all the throwaway lines I’ve fed into my travel-writing biography over the years, one creates the most fascination with readers. I am, according to a major American newspaper, “Jack Kerouac for the Internet Age.” This little quip, which appeared in USA Today when my book “Vagabonding” was first published in 2003 (and has since been referenced in a number of other venues), has long been a source of both flattery and bewilderment for me. I’m flattered, of course, because Kerouac was an innovative literary superstar, and “On the Road” was an iconic 20th century road book; I’m bewildered because Kerouac lived a conflicted, unhappy life—and because, 50 years after its publication, “On the Road” stands out as a startlingly bad blueprint for travel. I first read “On the Road” when I was 21 years old and preparing for my first vagabonding journey—an eight-month sojourn across North America. Like many young people dreaming of travel, I shared the giddy impulse at the heart of Kerouac’s book—the intoxicating compulsion to leave, to move, to go. At a practical level, however, I discovered that the novel’s Sal Paradise and Dean Moriarty characters weren’t the best role models for mindful, life-enlarging travel. Sure, spontaneity is good and holy, but there is something unhinged and aimless about Sal and Dean’s Benzedrine-addled wanderings. Dean is a compulsive hustler with serious attention-deficit issues; Sal is a boozy brooder who rarely exudes any lasting satisfaction with his experiences. Granted, Sal’s solo adventures early on in the book vividly portray the joys and challenges of hitchhiking—and one can feel the ecstatic energy of his house party with Ray Rawlins and Tim Gray in the mountains above Denver—but once Dean fully enters the story, the pair’s travels turn sloppy. Indeed, Sal and Dean cover a lot of miles between San Francisco and New York, but their adventures along the way are rarely more remarkable than what one might encounter in the freshman-pledge wing of a fraternity house: booze is swilled and dope is smoked; money is borrowed and hoarded, then frittered away on dumb indulgences; women are longed for, seduced and abandoned. In the third section of the book, which starts off with Dean leaving his pregnant wife in California, Sal and Dean repeatedly fantasize about running off to Italy, strangely oblivious to the American surroundings racing past outside the car window. When the pair later travels down to Mexico, their sojourn ends up less a quest for beauty and discovery than dope and hookers. Along the way, the Sal and Dean experience occasional moments of jubilation, but, asWhy Kerouac Matters author John Leland and others have pointed out, “On the Road” is at heart a morose book, laced with refrains of disappointment and sadness. Why, then, does “On the Road” remain such a potent romantic metaphor for the joys of travel? I’d reckon this has less to do with its actual content than with the myth that surrounds it. Read Kerouac’s daily journals from the time he was experiencing what would later become “On the Road,” and its clear that this myth was no accident. As scholar Douglas Brinkley points out in the introduction toWindblown World: The Journals of Jack Kerouac, 1947-1954, Kerouac intentionally embraced “the autobiographical impulse to create fiction out of one’s own myth.” Enamored with cowboy movies, hobo tales and the notion of the American West, he cast the madcap Dean (based on the real-life Neal Cassady) as a folk hero to balance Sal, his own, more subdued alter ego. This mythic “On the Road” pairing proved so effective that Kerouac spent the rest of his life trying to convince young fans that he wasn’t the charismatic figure of freedom and rebelliousness they’d idealized in his book. 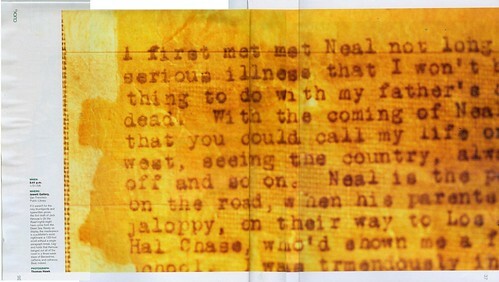 Just as potent as the myth of his characters is the legend of how Kerouac typed “On the Road” on a long scroll of butcher paper in one frenzied, three-week burst in April of 1951. Though this tale is only partially true (the typing session followed years of fragmentary, journal-based drafts and later went through meticulous rewrites), it underscores the ethos of spontaneity that surrounds “On the Road.” Add to this Kerouac’s photogenic good looks—as well as the 1960s counterculture revival that his Beat cohorts inspired—and “On the Road” becomes more than the content in its pages: It becomes a symbol for impulse, for restlessness, for youth. I suppose it was because of my own relative youth, then, that I merited a Kerouac comparison when my own travel-themed book came out four years ago. And while I certainly pay tribute to Kerouac in the pages of “Vagabonding,” “On the Road” has proven less of a template for my own U.S. travels than the work of frumpier, middle-aged fellows like Walt Whitman or John Steinbeck—writers who knew how to slow down, to linger, to listen. In the end, of course, it doesn’t really matter that “Leaves of Grass” or “Travels With Charley” hold more useful day-to-day travel cues than “On the Road.” Through their very compulsion to ditch home—to go anywhere, to do anything—Kerouac’s Sal and Dean do us one important service: They remind us that the most important step in the life of any traveler is that initial desire to be someplace else. This article was originally published September, 2007 by World Hum.